It’s funny – in both senses of the word – how many people think that awareness of foreign food started with Elizabeth David and stayed that way for ages. Now, I accept that David’s Mediterranean Cookery burst upon a grey, post-War scene of austerity in 1950 and brought quite a lot of sunlight into that world for the few who bought it. And they were, indeed, few. Elizabeth David was very active during the 1950s but her time came with the age of permissiveness, the Swinging Sixties. By then, the world was more accepting of the kind of gospel which she so eloquently preached. 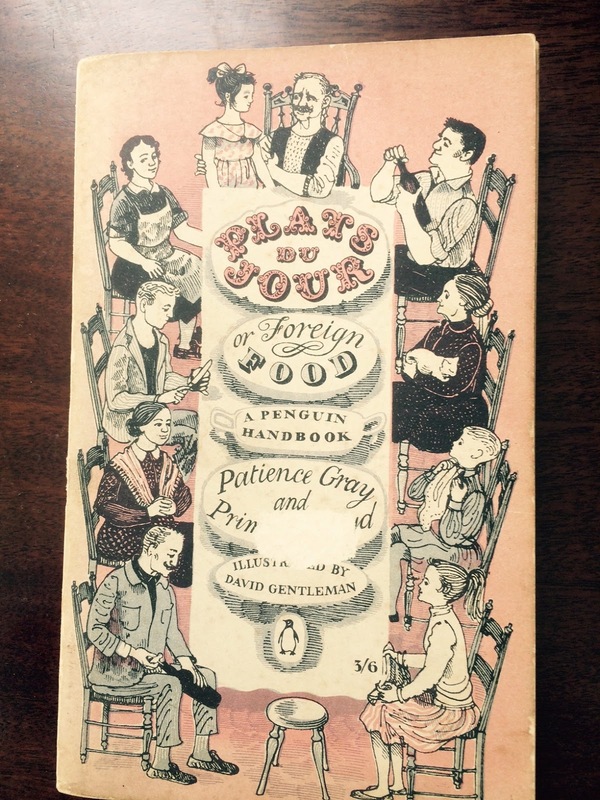 As a result, it’s easy to lose sight of important milestones in comparatively recent cookbook history and a case in point is Plats du Jour or Foreign Food by Patience Gray and Primrose Boyd, which appeared in 1957. Unlike Ms David’s books, at least initially, it was a runaway success, what these days would be called a publishing sensation. Within a few months, it had sold over 50,000 copies and it continued to sell vigorously right into the 1960s. I love that subtitle: Foreign Food. 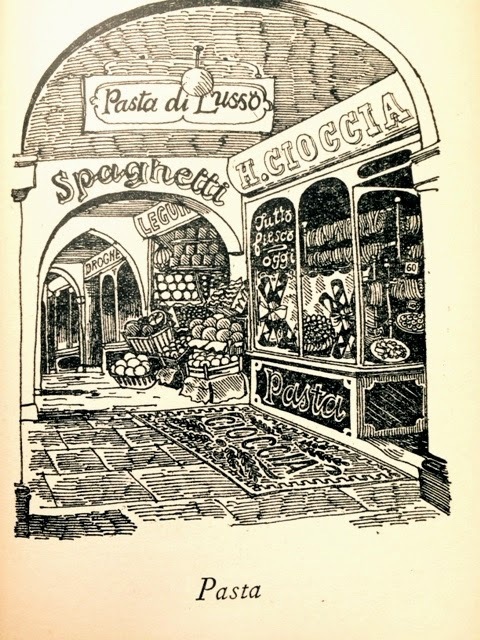 It promised something beyond the pedestrian drudgery of the familiar domestic kitchen, and the illustrations, by the just-graduated David Gentleman, expressed not just a lusty joie de vivre but also, very clearly, the notion that there are societies were food and the sharing of food is central and sacred. I like the fact that on the front cover we can see two bottles of wine being opened at the same time. I have a theory that Elizabeth David, while undoubtedly a missionary of sorts, was essentially writing for, if not the converted, at least for the cook who was used to a bit of adventure in the kitchen. In Plats du Jour, there is no such assumption. In fact, you could give a copy of it to a young person embarking on their first experience of independent living and they could use it as a very instructive manual. There’s a chapter on Pots, Pans, and Stoves, one on The Store Cupboard, another on Aromatics. In the chapter Applying The Heat we have a concise description of cooking methods from braising to roasting and from larding to poaching. This is an eminently practical book. I looked for Plats du Jour in the index to David Kynaston’s Modernity Britain: Opening the Box 1957-59 (Bloomsbury), part of his magisterial and vastly entertaining account of recent British history, but to no avail. 1957 saw Harold Macmillan succeed Anthony Eden as Prime Minister and soon afterwards he claimed that “most of our people have never had it so good.” This year also saw Britain test its first nuclear bomb in the Pacific, an infamous fire at Windscale (now Sellafield) and Andy Kapp making his first appearance in the Daily Mirror. This was the world into which Plats du Jour was launched, precisely half-way between the publication of Elizabeth David’s Summer Cooking in 1955 and her French Provincial Cooking in 1960. In this book we have tried to set down the recipes for a number of dishes of foreign origin, in the belief that English people may be stimulated to interpret them, and in doing so find fresh interest in the kitchen. The difficulty lies in the diversity of methods used to achieve similar results, in conveying the timing in preparation and the texture and appearance of the finished dish. If the cook has not some vague conception of what it should be like, some recollection to fall back on, it is unlikely that a recipe is sufficient to act as an infallible guide…. This is the very antithesis of the grinning celebrity chef telling how everything is “so easy and so quick”. Where the occasion is a special one, a pâté, or an extravagance in the form of Dublin Bay prawns or smoked salmon, may be called for to precede a Daube à la provençale or Poulet à l’estragon. But barring such exceptions, the liberating idea prevails, a concentration of culinary activity, a close attention to a particular dish, which, once composed, can often be left to combine its flavours in a slow oven, later to be enjoyed with a glass of enhancing wine. And, apart from anything else, just look at the use of commas; in this kind of writing, they are precision instruments. Reduce the following ingredients to a molecular state with a heavy chopping knife or mezzaluna; 1 dessertspoonful of capers, 2 anchovy fillets, 1 shallot, and 1 clove of garlic. Put this preparation into a sauceboat, and add to it a tablespoonful of very finely chopped parsley and basil. Dilute with 3 tablespoonfuls of good olive oil, and the juice of 1 lemon. Basil and “good olive oil”. I suspect that would have entailed a trip to Old Compton Street in 1957. And just look at those lovely Oxford commas. Plats du Jour is a gem of book and while it does have a certain period charm, the essence of what it is about is as fresh today as when it first appeared. There are lots of copies available on www.abebooks.co.uk from as little as £8.50; and it was reprinted by Persephone Books in 2006.